Editor’s note: At the end of round robin play at the Pan-American games in Toronto Canada, the USA’s Tony Mancha had the best/lowest ERA of any pitcher in the competition, with a microscopic 0.41. How did you get started in softball: When I was young my dad played so I kind of followed in his footsteps. I started pitching and was the wildest pitcher out there! I had a coach that told me you’re going to be good if you keep throwing so I kept throwing and here I am. Thanks Gary Galindo! 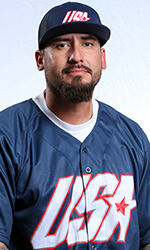 Click here to view the complete/official player profile for Tony Mancha. For more at Fastpitch West on Tony Mancha, click here.